Description: This training ride is for those that don't mind putting in the work over the off season so they can come out strong once the season begins in April. A little cold and suffering during the winter for all the speed and glory during the cycling season. One hour of riding loops in BBP. Objective is to learn how to ride in a paceline. 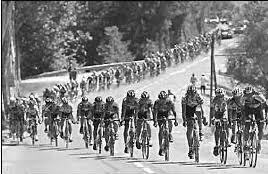 If you get dropped, don't worry, wait until the peloton comes back around and try to hold on a bit little longer this time...one hour of speed, high pace, and intervals.